Bud Ekins, the champion motorcyclist and stuntman has died. 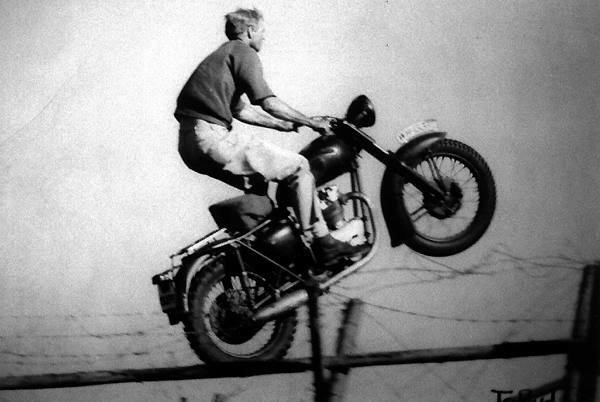 Probably his most famous stunt was doubling for Steve McQueen in The Great Escape. Bud did the jump over the barb wire fence at the Nazi POW camp. Everyone thought McQueen did the stunt himself but it was Bud. He also did a lot of the riding in the opening credits of the television series Then Came Bronson starring Michael Parks. It’s hard to get copies of this show but it’s definitely worth it, a very cool show and some of the shots of Bud, driving across an incredible bridge over Bixby Creek in Big Sur, zipping along the beach just at the edge of the breaking surf, are inspiring. By the way Michael Parks is one of the stars of my film One Night With You. Joe Montgomery, my DP, grew up in Hollywood and told me he used to go to Bud Ekins motorcycle shop and watch Von Dutch pinstripe bikes. 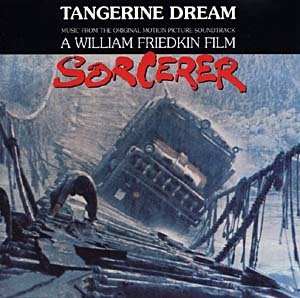 Bud Smith, an old friend and great editor, was an associate producer and editor on William Friedkin’s Sorcerer. Bud Smith was good friends with Bud Ekins. Ekins did stunt driving on Sorcerer and Smith told me he was in the cab of the truck with Ekins driving when they crossed the rope suspension bridge. If you look at the poster for Sorcerer there’s a picture of the truck on the bridge, it’s a frame enlargement from the 35mm original picture negative. In the next frame the truck falls off the bridge into the river. The Truck goes over in the next frame! The two Buds were in the cab. Bud Smith said Ekins was cool as a cucumber, remembering to hold his radio and his cigarettes up over his head so they didn’t get soaked. 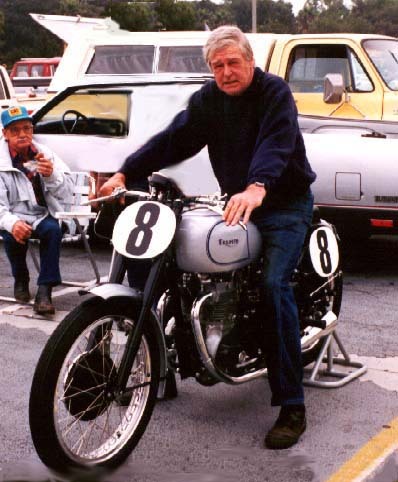 Bud Ekins did the motorcycle stunt in Bullit as well, sliding across the highway during the great chase scene just before the climactic finish. I heard him on the radio one time telling of how Steve McQueen would buy whole batches of motorcycles from him, then he’d forget to make payments, Bud would have to go up to Steve’s house and repossess the bikes, then McQueen would find out , come down to Bud’s shop, yell at him, pay up, take his bikes back and they’d be friends once again! Goodbye Bud, you led a colorful life and gave us a lot of thrills at the movies. Check out the dents in the front wheel! Had no idea that was Ekins at the start of “Then Came Bronson”, but your tribute has now given me the impetus to dig up those old grey market copies of the show just to check his stunt work out. I remember Ekins appearing in a couple of Steve McQueen documentaries. Also, I’ll watch Parks in just about anything (yes, I’m even including stuff like CLUB LIFE and “Walker: Texas Ranger” appearances), so I’ll be sure to keep an eye out for your film! I’ll invite you to our next screening. Are you in Los Angeles? Unfortunately, I’m not. But i’m hoping for an extended stay some time after Christmas. If it happens to fall around then, I’d love to attend! Where are you at? We’re going to New Orleans for a film festival. Currently: Winnipeg, Manitoba. Though I hope to relocate to Toronto within the next year or two. We’re waiting to hear about the Reel Heart Festival up in Toronto, it happens in June. If we get in I’ll let you know. Did Bud Ekins ever appear and/or do MC stunts in “Rat Patrol”? I can’t find any reference for Rat Patrol but I’ll ask around. I just noticed that Bud di Race with The Devil, a cool movie with Warren Oates, Peter Fonda & Loretta Swit and The Thing With Two Heads with Ray Milland and Rosy Grier! My father raced in the 50â€™s and was in almost every desert race and the Catalina GP. In fact he has footage of the Catalina races; he was a Long Beach, CA Hilltopper. 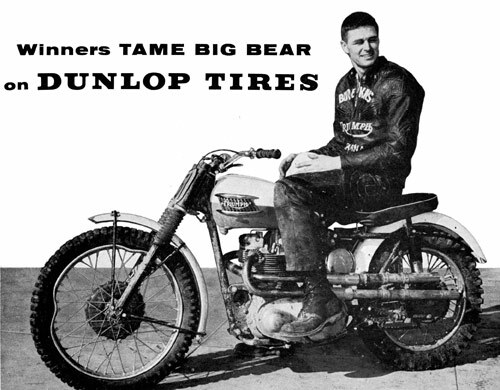 But he always said that Bud was by far the best desert racer. This is one of my dadâ€™s stories; He was at a desert race and Bud Ekins was a no-show, the pack starts off and about 15 minutes into the race my dad looks way out to one side and sees a trail of dust off the main course, it was Bud, he showed up late, unloaded his bike, caught up to the pack and past everyone and won. Because of my dad and Bud Ekins I ride a Triumph today. Thanks for posting that great story about Bud. You should get your dad’s footage out on a dvd or a documentary about the late great Mr. E.
How can i get a copy of the story of Buds life ? im in London cant find anywere.. any clues for me.. Regards Bob..
Somebody should write a biography of Mr. Ekins. I don’t know of any but I’ll look around and let you know if I find any thing.